We, as Americans, cherish fairness. We like to believe that people are not punished or unjustly rewarded without justifiable cause. We like to dwell on parables of white virtue and black advancement culminating in the flowering of goodwill all around. Events sometimes force us to widen our gaze and focus on terrain we would rather not see. The 2006 court-martial of Cadet Webster Smith at the United States Coast Guard Academy did just that. The Webster Smith case was a litmus test for justice in America. Every once in a while a case comes along that puts our humanity as a people, and as Americans, on trial. Everything that we profess to stand for as Americans was on trial. Our sense of justice in America and particularly in the U.S. Military was on trial. This was no ordinary trial. Our humanity was on trial. Our system of justice was on trial. This case dissolved the deceptive façade and exposed certain moral deficiencies in our system of justice. This case alone puts the legitimacy of the entire military justice system at risk. Webster Smith availed himself of every path to justice that we have. He filed an Article 138 Complaint under the UCMJ. He faced the Article 32 Investigation with two lawyers. He asserted all of his Constitutional Criminal Guarantees. He knew and made appropriate use of the Right to Counsel, the Right to Remain Silent, the right to a jury trial, the Right to Confront the witnesses against him, the right call witnesses on his behalf, the right to present evidence favorable to him, the presumption of innocence until his guilt was proven beyond a reasonable doubt, and the right to argue his case before the Jury. His Appellate Counsel, Ronald Machen, was top notch. He became the United States Attorney for the District of Columbia. In April 2015, he left the position and returned to the law firm WilmerHale. Wilmer Cutler Pickering Hale and Dorr® has played a leading role in historic events and landmark cases that have shaped the nation and left their mark across the globe. In matters ranging from the Army-McCarthy hearings to the legal defense of civil rights, from the 9/11 Commission to the restoration of the rule of law in apartheid-torn South Africa, their lawyers have made contributions that have profoundly affected our society. Because the law is still a profession as well as a business, lawyers have special obligations to the administration of justice and the development of the law. Their lawyers are encouraged to meet these obligations through pro bono work. Attorney Machen represented Webster Smith on a pro bono basis. He received no fee. Webster Smith appealed his conviction all the way to the United States Supreme Court. He lost at the Coast Guard Court of Criminal Appeals. He lost at the Court Of Appeals for the Armed Forces of the United States. The U. S. Supreme Court dismissed his appeal without comment. And, on top of the aforesaid, he filed a Complaint of Discrimination, pursuant to Commandant Instruction 5350.11. He had an air tight and fool proof case of disparate treatment. Yet, he lost. He lost because the System was manned by the most incompetent people God ever created. They did not have a clue as to what was going on in their office. The most significant case in the history of the Department of Homeland Security and the Armed Forces of America came to them and they were not capable of processing it properly. On top of everything else, Webster Smith had bad luck. At some juncture along the way, most other people would have won, but not Webster Smith. One has to wonder why. There are some who will say that it was because he was Black. They will say that the System was designed and administered by white men and women; and, no Black man can obtain justice in that System. They might have a point, even though some of the decisions made concerning his case were made by Black people in key offices. We now see that there is little or no justice in military justice. Any reasonable person who looks at this case or any other high profile military justice case would have to conclude that the Military Justice System is not designed to render justice. It is a system designed to punish. The entire courts-martial system, from Summary Court-martial to General Court-martial, has one specific purpose; that is to punish anyone who commits an offense against the Uniform Code of Military Justice. This is intended to be the definitive word on the first and only court-martial of a United States Coast Guard Academy cadet. 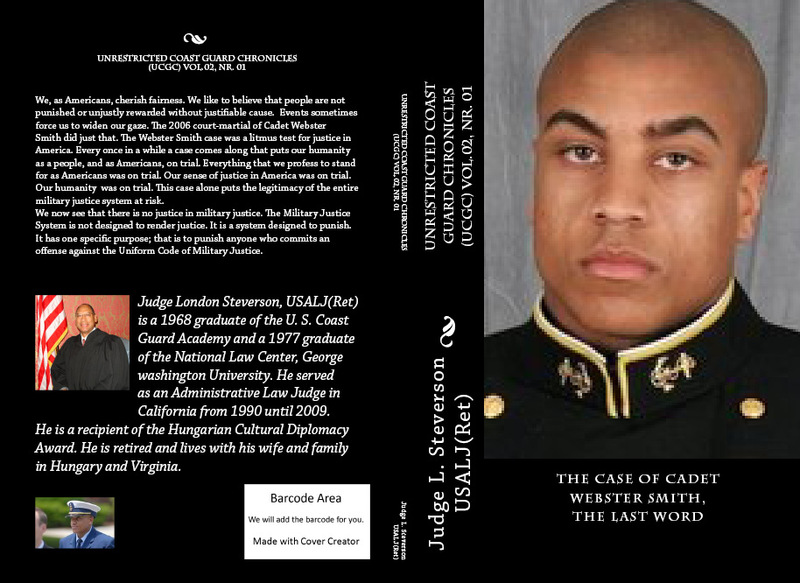 The Case of Cadet Webster Smith, The Last Word is written from the perspective of the accused, Cadet First Class Webster Smith. It is not written from the perspective of his accusers. A prior account of this case focused on the women involved. Conduct Unbecoming an Officer and a Lady told the story of the court-martial from the perspective of the witnesses for the prosecution. Why now? Well, there are several reasons. This Case is unique in that this has never happened before. No other Coast Guard Academy Cadet has ever been punished at a General Courts-martial. That is saying a lot for an institution that has been around since 1876. Also, it has been ten years since the trial and conviction. An entire decade has passed. The sentence has been served. The Supreme Court Petition for A Writ of Certiorari has been denied. The Record is complete. Cadet Smith was a senior when the trial began. He was within months of graduating from the Academy, but he was expelled. No Clemency was granted. His career was ruined. His life was irreparably harmed. For ten years he was required to register in the State of Texas as a Sexual offender. He married, had children, and for ten years he was not allowed to attend the birthday parties of his children. This Case has been hotly debated in certain quarters. The Coast Guard has tried its best to forget that this court-martial ever occurred. However, I fear that this Case will be debated and talked about for years to come. Long after the political and social climates that gave rise to this Case have abated; cadets, officers, politicians and parents will be discussing the Webster Smith Case. What distinguishes this book from other books on the Case is that this book distinguishes how the Coast Guard Legal Officers and the senior Academy officers disposed of this case as opposed to other cases with similar fact patterns. 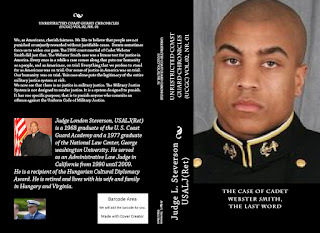 This Case will serve as a witness to an era in the United States Military and its Service Academies that was ripe with cultural and ethical upheavals, proceedings with plenty of due process and little justice, sexual assaults in the military, retaliation against whistleblowers, mind blowing results, aggravation and frustration.